Where did Kodak go wrong? You no longer think of Kodak when making a list of the world’s greatest brands, you no longer think of Kodak. Instead, a few other names surface quite regularly: Coca-Cola, Starbucks, Apple, Sony, Disney, Microsoft, Nike, and even Harley Davidson. These brands represent a value from the perspective of the customer. They either elicit a preference or they command a willingness on the part of the target market to pay a premium to own it. Brand pundits and experts often tell interesting and compelling stories of how these brands took a place among the pantheon of marketing gods. They explain how those brands came to be, what they promise and how loyal the customers are to it. How many times have you heard a “brand expert” recall the power of the Harley Davidson brand by asking, “Would your customers tattoo their logo on their arms?” It makes for great theater and certainly demonstrates the sense of identification that the Harley rider has for the brand. However, let’s look at Kodiak if we are going to hold these brands up as models to emulate. Because it’s more interesting to look at one that was once on top and is now irrelevant. Here then, is a partial list of powerful brands from the 1980s. It is not intended to be complete or even broad, just a bit of food for thought. In 1982, you would have found Sony, Converse, Sears, Commodore, RCA, Microsoft, Chevrolet, Coca-Cola, Disney, and Kodak. Some are still as strong as ever. Others have gone away — some completely. Associated Press reported recently on the downturn Kodak has taken recently. And it warrants a discussion about brand and the responsibility brands have to remaining relevant. Kodak posts narrower 1Q loss, sales edge up By BEN DOBBIN, AP Business Writer ROCHESTER, N.Y. – Eastman Kodak Co. said Thursday its first-quarter loss narrowed to $115 million as it chases a bigger stake in digital photography. Hit by carry-over restructuring charges after navigating a four-year digital overhaul, the photography products maker lost the equivalent of 40 cents a share in the January-March quarter, compared with a loss of $151 million, or 53 cents a share, a year earlier. Kodak was a brand that represented what was important to all of us, reached beyond the category of film and placed itself front and center in the fabric of our lives. We trusted it with our children, weddings, vacations, pets, and holidays. It owned heritage, innovation, safety, and an emotional attachment. We grabbed the Kodachrome with zeal, even when the camera store salesperson tried to talk us into the more reasonably priced Fuji film. Paul Simon even wrote a song about it. We emphasize to clients to see yourself beyond the category of product you sell. In other words, don’t confuse the process with the purpose that drives the purchase decision. For example, airlines are not in the flying business they are in the transportation business. More specifically, they are in the time-saving transportation business. This realization accounts for Kodak’s loss of importance and preference. The promise of speed has been lost. It was most certainly a film & film development company. But its brand reached much further than that. We bought the film and paid for the processing because we cherished the importance of the memories we were capturing. This was no place to skimp. Kodak began to fail when it stubbornly held onto a profit model that no longer worked. Like the ostrich with its head stuck in the ground, Kodak refused to embrace the digital revolution. It chose to hold onto its model of selling both film and development. It always manufactured cameras and paper as well as film and chemicals. But its leaders refused to see the writing on the wall. Instead, they pretended the old profit model was all that there would ever be. The world changed. And Kodak had the infrastructure, the capital, and the distribution to OWN the digital market. 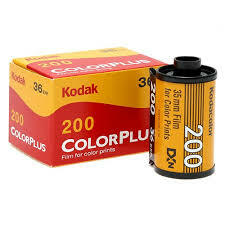 Kodak would have a very different report on earnings had it transitioned from a centralized film processor to a co-brander of ink jet printers and glossy paper. It would be the market leader in an ever-expanding market. Instead, it is a glory brand from 40 years ago. One we remember fondly but don’t use. Sometimes, fundamental shifts in the market changes everything. Brands can either re-tool or re-configure to leverage their equity and remain vital and dominant or they can sew the seeds of failure. Kodak chose the later. Today, airlines are following Kodak’s example. They taught customers to shop by price. They hold us captive with affinity programs that feel more like chains than benefits. And they stubbornly cling to a model top heavy in service salaries all the while cutting service and jobs. Sometimes, it is the business model itself that needs the most surgery. Even the best of brands cannot change that. Remember this old Kodak ad?